At the time of writing, and to the very best of my knowledge, the world has yet to come to an end and doesn’t seem likely to over the next few days either. So the prophets of doom will soon have to cease their bleating and start picking on next year. Neither have we succumbed to life in a bleak dystopian nightmare monitored closely by a big brother totalitarian government, though some may argue that we’re heading in the right direction. The only Armageddon approaching my direction is in the form of two very large motorcycles, at war with one another for some time, and both desperate to settle this row once and for all. 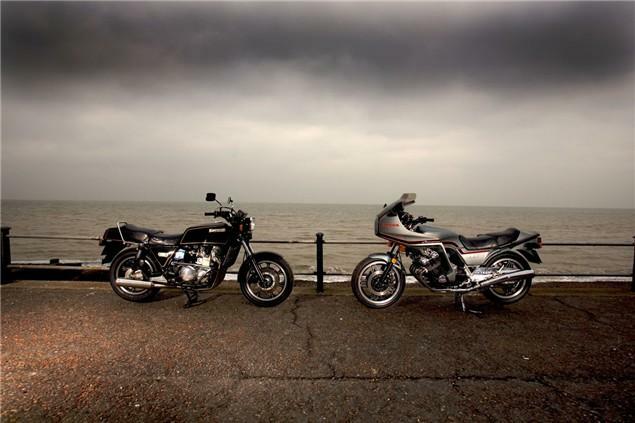 Honda’s CBX1000 and Kawasaki’s Z1300 - what a lot of metal. The two contenders are representatives of sparring Japanese giants, both too pig-headed to let the other win what is perhaps increasingly becoming an exercise in futility, and both proud enough to continue with their technological flag-waving that fewer people happen to notice each year. It’s true to say that since their respective launches neither manufacturer has sold the level of units that they had envisaged. 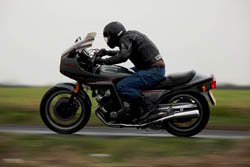 (Even the gas-happy Yanks voted with their wallets for the more nimble alternative, and globally, the winner of this war is already Suzuki’s ultra-capable GS1000, so we’re almost fighting for a second place here). Nor have they changed forever the direction of top-end performance motorcycling. What they have done is unleash two of the most wonderfully potent, inspired, ingenious and insane muscle-bound masterpieces that motorcycling will be eternally grateful for. We can’t afford to buy them and we certainly can’t afford to run them, but God, how we want them. Brave Benelli have limped off to lick their wounds, but these determined manufacturers have stuck to their respective guns and stubbornly moved forward in their own directions to inevitably meet up in this head-to-head with new, improved armoury. The sportier CBX has, admittedly one year ago, shed its brutal naked appearance in favour of a sleek, super-modern aerodynamic set of bodywork. It also boasts their Pro-Link mono-shock suspension system. Is it still the howling beast of old or are we witnessing the arrival of fancy plastics and a more touring-focused swan song? Kawasaki, in a show of huge confidence, has left the Z1300 pretty much alone, sticking to what it knows best – making big muscle. This year’s model flaunts the future, digital fuel injection, and not a lot more save for slight modifications to the engine cases. Will it make the difference to keep the performance advantage over the aggressive Honda, while their owners are left trying to set up their bank of carburettors? The answer is probably yes. Whilst neither of these behemoths have lost any weight, the Honda is sporting a slightly de-tuned motor (down 5bhp to 100bhp) and a heavy set of clothes. However, whatever it may lose in a straight-line fight, it’s likely to make up on the curves, where the Kwak has traditionally been weaker. The Kawasaki, rightly or wrongly is still lauding it over the Honda. Whilst the Big K started working on their monster three years before Honda on theirs, you could buy a CBX before the Zed was even launched at Cologne back in ’78. That’s a five year gestation period against Honda’s incredible two. While Honda have had the sportier edge and managed to pip Kawasaki to the launch post, the green quarter of Japan stuck with their drag-strip credentials and held on to the bragging rights for sheer capacity and audaciousness. The truth is that both companies should be genuinely proud of the beasts that sit before us. They’re not the fastest or best handling machines on offer, but certainly the most supreme expressions of innovative achievement anywhere in the motorcycling world. They are outrageously powerful yet equally weighed down with sophistication and potential in a power-based future where worlds collide and fuel is free. The power-to-weight ratio is a cruel mistress who must be obeyed, and this is why I see a future of development in the direction of puny yet lithe, one-litre, four-cylinder super-heroes. Putting the sheer size and girth of these things aside for a moment, both bikes disguise their weight incredibly well. Both have tried hard to keep their C of Gs as low as possible, and it shows. On a flat surface, it is hard to accept how much metal is being pushed and pulled here, until I try and fail, hernia narrowly avoided, to lever the Z13 without the necessary second adult onto its centre stand. Hardly surprising, when the motor alone weighs in at a hefty 130kg. Reality bites hard as I compose myself and push the starter button. All is well again as the silky smooth burble whispers its potential prowess at a standstill. I circle the bike, admiring the unashamed angles that dominate the design from the engine to the bodywork and up to the instrument console. 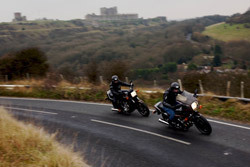 It shouts confidence with the minimum of decibels yet stirs the soul with a twist of the throttle. The luxurious glory of six cylinders singing together is a sound that deserves to live forever, and if this is the beginning of the end, I can only feel privileged to be refereeing such a momentous bout. Swinging out onto the open road, I’m instantly reminded of the original goal of producing the ultimate in technical superiority. Water-cooling mated with what has to be the pinnacle of shaft-driven technology cannot go unnoticed. The levels of damping between the motor and the rear wheel make for an indecently smooth transmission and power delivery as the gearbox is worked into 5th. The vibration levels are eerily absent from as low as 1,500rpm as more and more fuel is forced into the system. My initial observation is that the mid-range surge isn’t as strong as the previous MKII model, but what is available comes in a more urgent and linear delivery, with no detrimental effect to the overall character. Gone with the extra serving of torque, is the likelihood of flooding, an affliction prone to the pre-injection models. As is the likelihood of improved starting, both hot and cold which will be a welcome improvement. The motor is clearly the strong point of the Kawasaki. There is so much shove that this high-speed touring machine can easily be mistaken for a suicide rocket. The claimed 10bhp increase that comes with the fuel injection is subtle but noticeable as it arrives at its peak at around the 8,000rpm redline. Cruising is where it’s at though. The legal speed limit is reached in a few seconds as the revs settle to a lowly 4,000rpm. Whether at 70mph or 100mph at a shade under 6,000rpm, the Zed makes it perfectly clear that it is happy to maintain any given velocity for as long as is required. With a generous 27 litre fuel-tank capacity and comfortable riding position, progress will only be interrupted every 150 or so miles, even with a passenger. Only the lamentable lack of fairing will have any effect on a perfectly relaxing journey, such is the soothing nature of its colossal heart. It‘s more than about sheer power though. This hunk of metal produces a veritable symphony at the slightest flick of the wrist whether at standstill or on the move, and it is truly addictive. Even in town the Zed remains civilised and relatively nimble, and its 1,580mm wheelbase will thread neatly between traffic with feet placed securely on the pegs, thanks to the low C of G. Out of town and on the move, certain elements previously unnoticed become suddenly apparent. Firstly, the spongy brakes can only deal with so much velocity. Despite employing three 260mm-sized discs for the job, attempting to scrub the speed off 400kg of machine and rider is a very big ask indeed. Throw on a passenger and luggage and you’ll need to carry a spare set of brake pads under the seat at all times, along with a rear tyre. Secondly, despite the oversized frame and forks that do a credible job of containing such excessive mass, you have to prepare the 13 for corners. Sure, it’ll cope handsomely with sweeping A-roads but throw in some tight bumpy stuff with a few undulations and the air-assisted suspension won’t stop the chassis from tying itself in knots. 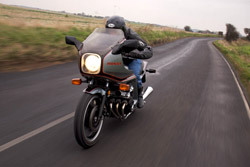 It is at this point worth noting, as I park up and eye the CBX with a little suspicion, that the Z1300 is really a gentleman’s express with a rather large bulge in its trousers. I wonder what the game plan is here. Have Honda thrown in the muscle-bike towel after failing to capture the imaginations of their intended audience? Or have they merely distanced themselves from Kawasaki and moved the game forward into the more obvious sport-touring arena? Their marketeers would have us believe that this is every bit as much a pure sportsbike than its predecessor. Either way, what sits before me is a very sophisticated looking tool – almost a CBX in disguise – with more than a fresh set of bodywork. Gone is the traditional twin rear shock set-up, and in its place is the bang-up-to-date Pro-Link (Progressive Linkage) mono-shock system. Not wanting to be out-done, Honda also now boast air-assisted adjustment at both ends to aid comfort and provide a sophisticated riding experience. Despite an unwelcome de-tune in the name of improved mid-range performance, the motor is familiar and more frantic sounding than the Zed, even blipping the throttle gently. The appearance may be sport-tourer, but the motor still sounds sharp and business-like and indicates that it won’t mind being revved hard. Which is exactly what will be necessary, given the significant 239cc capacity disadvantage. I have to re-calibrate as I work through the 5-speed ‘box and admit that I should have ridden the Honda first. It sounds good and feels good but it is lugging around the same weight as its opponent, so has to work harder to feel slower. More gear changes are necessary and the CBX must remain 2,000rpm higher and maybe even one gear lower than the Kawasaki to match its thrust. That’s not to say that the Honda is outdone here, it’s simply a different approach to going very fast. Both have a realistic top speed of 130 – 135mph but the Kawasaki will get there more quickly and with less effort. This is where the Honda plays its ace card. In reality, it’s just not possible to maintain a cruising speed of 100mph and above on the Kwacker because the lack of wind protection makes it too damn uncomfortable. The Honda however, would cruise at 100mph for days at a time with its sleek and effective new fairing. It not only looks good, but also manages to not obscure the handsome motor, which still exposes itself due to the lack of down-tubes. And aircooling looks so much better than a water-jacket. It doesn’t end here either. The Honda’s new (an industry first) ventilated lightweight discs – all three being full-sized – offer more powerful braking with better feel than the spongy offerings of the Kawasaki. Add to that the fact that the CBX will attack the same back roads with a higher level of aggression, accuracy and compliance than the Z13 and suddenly this fight is beginning to level. There’s not much to separate them in terms of ground clearance. 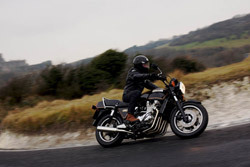 The wider CBX, with its shorter wheelbase, flicks more easily and thankfully, neither machine has an engine that protrudes further than its handlebars. This is CBX country. Challenging twists and contours with a screaming six for company. Keep it between 4,500rpm and the 9,500rpm redline and the grin will stay with you, but it feels lazy and flat below that (relatively speaking, that is). With 70mph at a buzzy 5,000rpm, you begin to get the picture. The six 28mm keihn CV’s are sucking like crazy via the accelerator pump on carb no.3 and the system is very much suited to the chain drive set-up on the snarling troublemaker. It really is a matter of horses for courses here, depending on your style of riding and assuming that you can stomach the running costs. More importantly, enjoy it while you can because these gas-guzzlers are unlikely to be the future. So is there really a winner to the ultimate street fight? Yes, of course there is. Only one of these beasts is housing the greatest engine ever to grace a performance machine, and possibly the greatest of all time. Add the smoothest drive train available and faultless fuel injection and the answer is quite simple. If Honda had managed to squeeze out more power and shed some weight, it could be gorging on the spoils of victory but they took the wrong fork in the road while Kawasaki stuck to their muscle-based principles and eventually flattened Honda with brute strength. Take a bow, Kawasaki. The war is over. At the time of writing, and to the very best of my knowledge, the world has yet to come to an end and doesn’t seem likely to over the next few days either. So the prophets of doom will soon have to cease their bleating and start picking on next year. Neither have we succumbed to life in a bleak dystopian nightmare monitored closely by a big brother totalitarian government, though some may argue that we’re heading in the right direction. The only Armageddon approaching my direction is in the form of two very large motorcycles, at war with one another for some time, and both desperate to settle this row once and for all. 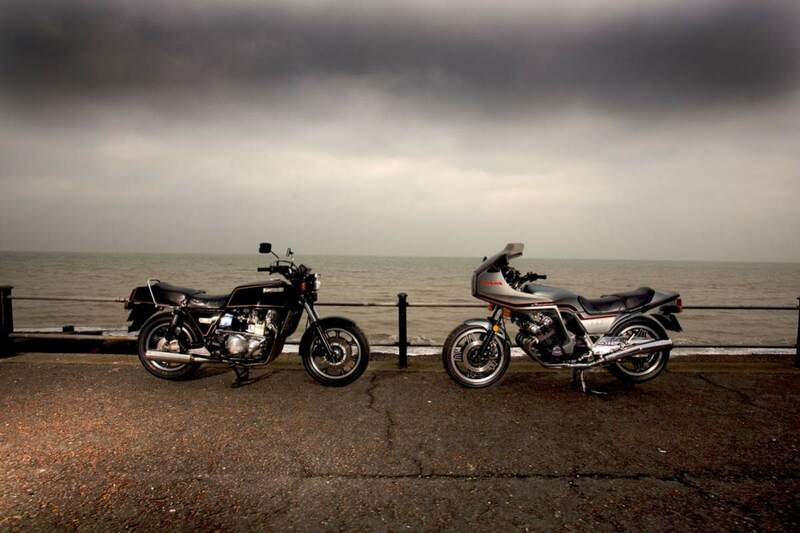 Honda’s CBX1000 and Kawasaki’s Z1300 - what a lot of metal. Brave Benelli have limped off to lick their wounds, but these determined manufacturers have stuck to their respective guns and stubbornly moved forward in their own directions to inevitably meet up in this head-to-head with new, improved armoury. The sportier CBX has, admittedly one year ago, shed its brutal naked appearance in favour of a sleek, super-modern aerodynamic set of bodywork. It also boasts their Pro-Link mono-shock suspension system. Is it still the howling beast of old or are we witnessing the arrival of fancy plastics and a more touring-focused swan song? Kawasaki, in a show of huge confidence, has left the Z1300 pretty much alone, sticking to what it knows best – making big muscle. This year’s model flaunts the future, digital fuel injection, and not a lot more save for slight modifications to the engine cases. Will it make the difference to keep the performance advantage over the aggressive Honda, while their owners are left trying to set up their bank of carburettors?